Step 2 – Setup web deployment handler, to allow non-admin user be able to deploy remotely. Grant read permission to %windir%\system32\inetsrv\config. Grant modify permission to %windir%\system32\inetsrv\config\applicationHost.config. It will be easier to assgin all “contentPath, createApp, iisApp, setAcl” providers to the same RunAs user credential. Application folder also needs to assign full control permission to delegate users. Sometimes local account donesn’t work, e.g. app folder is on network sharing, we can always assign RunAs account to administrators group. Step 3 – Turn on delegate request tracing. IIS Magement service needs to restart to enable tracing. 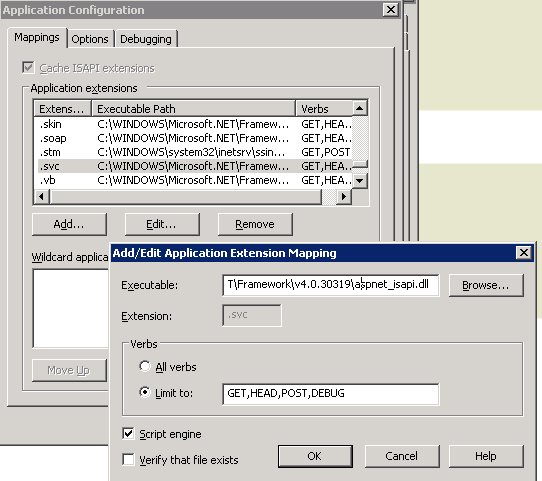 Step 4 – Client side install IIS Manager for Remote Administration extension for IIS7 manager. After install finished,open iis7 manager. File->connect, pick connect to application, type in server name/site name/application name, user/password, if problem occur, check tracing logs at server side to investigate the problem, usually it’s the delegation or permission setting missing. 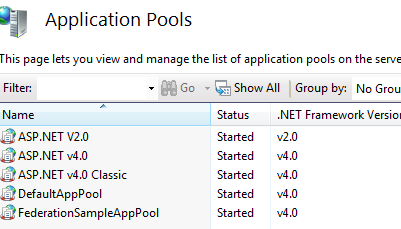 In IIS7, the underlying dotnet framework for application is controlled by AppPool, each apppool can have its own version of dotnet framework. In IIS6 we don’t have this nice switch panel, the only way to switch is by changing the .svc mapping in Application Configuration window.